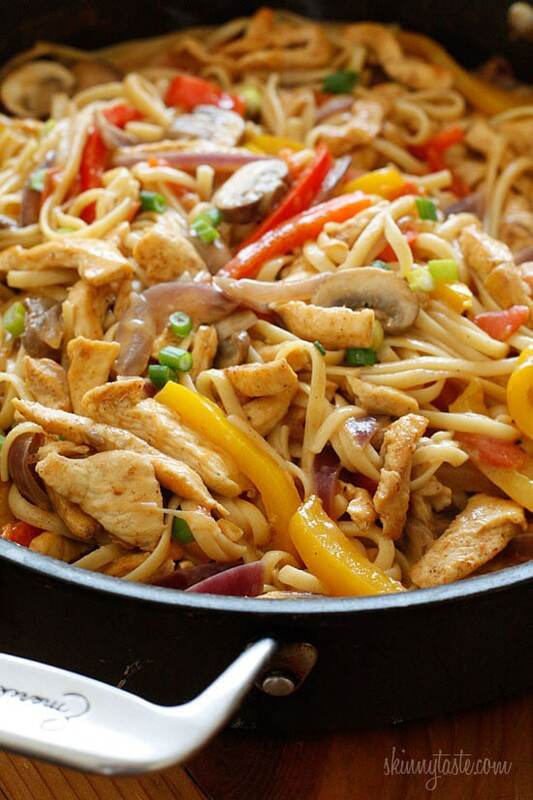 Cajun Chicken Pasta is lightened up, made with chicken strips, bell peppers, red onion, mushrooms and scallions in a creamy light Cajun sauce. One of the easiest ways to lighten up a pasta dish is to add tons of protein and vegetables to your dish which keeps the portions large and the carbs low and this dish is a perfect example. Be sure to be generous with your Cajun spices, it should have plenty of kick so don’t be shy! I took a knife skills class at Sur La Table this week with my girlfriend and of course I HAD to buy a new knife and cutting board there. I was so excited to put my new skills to work and cut my veggies like a pro with my new knife, a task I would normally dread. 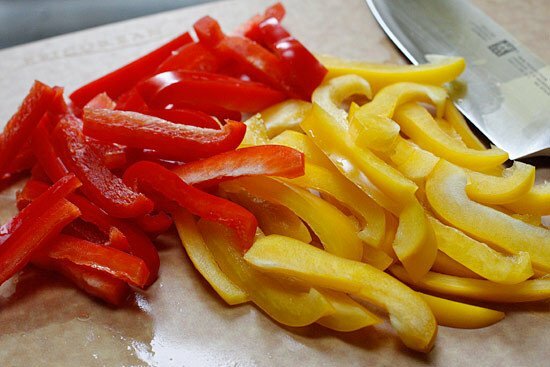 This dish comes together rather quickly once all your vegetables are chopped. You can make this with shrimp instead of chicken, or use a combination of both. Make this vegetarian by leaving the chicken out or replacing it with tofu and swap the chicken broth with vegetable broth. You can also make this gluten-free by using brown rice pasta and replacing the flour with 1 teaspoon of gluten-free flour. 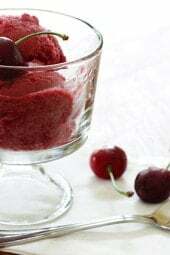 In a small blender make a slurry by combining milk, flour and cream cheese. Set aside. Season chicken generously with Cajun seasoning, garlic powder and salt. Heat a large heavy nonstick skillet over medium-high heat; spray with cooking spray and add half of the chicken. Sauté 5 to 6 minutes or until done, set aside on a plate and repeat with the remaining chicken. Set aside. 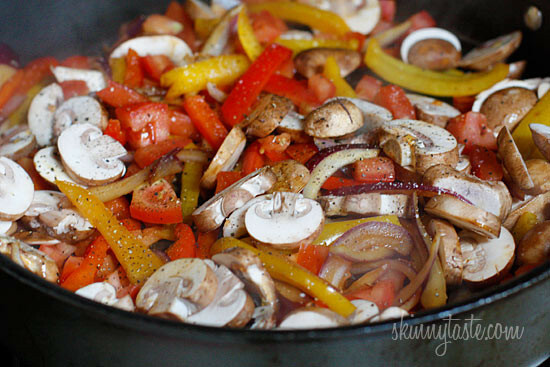 Add mushrooms and tomatoes and sauté 3-4 more minutes or until vegetables are tender. Season with 1/4 tsp salt, garlic powder and fresh cracked pepper to taste. 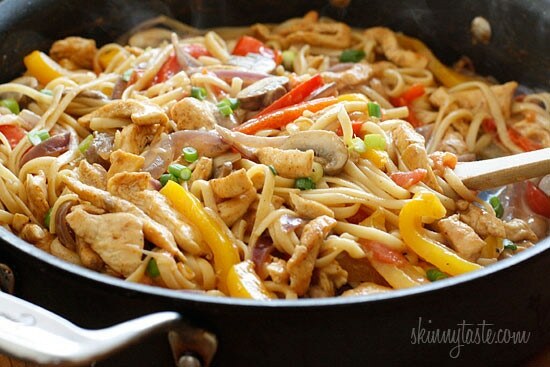 Return chicken to skillet; adjust salt and Cajun seasoning to taste, cook another minute or two until hot, then add linguine; toss well to coat. I’m absolutely hooked on this dish! I cut the recipe in half and dropped the amount of pasta and got it down to 7 points (only used 3 oz of penne), I added shrimp and extra veggies and it is so good and filling! The prep does take some time but it’s worth it. hi, is there any way to make this in the instant pot? I am looking for the specific amount of garlic powder and salt suggested for seasoning the chicken and the dish. Gina, can you please share that? This is my 2nd time making this recipe, it’s great! I always eyeball this, as long as there is a layer covering the chicken. The garlic powder is not in the ingredient list. How much should be used? Help! I’ve made this twice following the recipe exactly, and both times it is very watery! Does anyone know how to fix this? 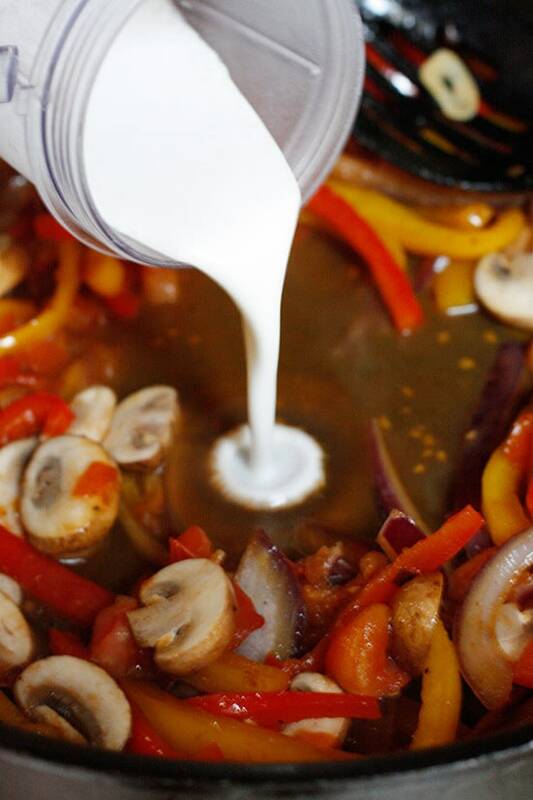 You can try using 2 TBs cornstarch instead of flour if you want a thicker sauce. 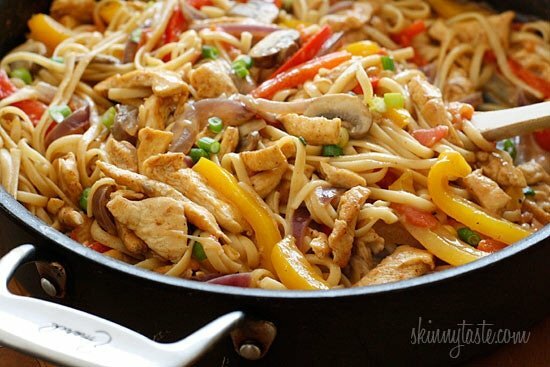 I made this tonight using soymilk and nondairy cream cheese, and it turned out amazing- that might even be an understatement!I have to say that my husband who doesn’t eat pasta especially long noodles- ate 2 servings and taking leftovers for lunch!Very easy and fast prep if you’re undecided to try this then yes try it!Thanks Gina!!! The “cream” sauce recipe is great. I have yet to make the full recipe but if you use what you have on hand season it to your liking that sauce piece is so versatile. Can’t wait to plan ahead and make the complete recipe. Made this dish a couple days ago and it was so so good! 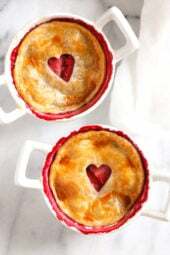 Sent the link to my sister also.Thanks for sharing such yummy & lower calorie recipes! This is a delicious dish. There is a lot of prep work but it is well worth the effort. I followed the recipe exactly and had no trouble with it being watery. It thickened beautifully and made a sauce to die for. Next time I will serve it with crusty bread so I can get every drop of the sauce. I won’t even mind having to add Weight Watcher points to the meal for the bread. Yummy! Thank you Gina. Tried this years ago when i was on WW, and just rejoined and this has become a weekly staple in our house as I get a decent amount of leftovers for lunches. Thank you so much for posting this!! I made this from your cookbook last night for dinner and it was AMAZING!!! My husband- Who absolutely hates all vegetables- Ate every bite, took the leftovers for lunch today, and said he will be requesting this more often!! Thank you for the recipe!! This is one of our favorites! We like it spicy so I add a lot more cajun seasoning. Love all the veggies and the creamy sauce. Even better the next day! Love this!! I sub chicken sausage for the chicken breast, so spicy and yummy!! This is the number one requested meal by my 4 kids! It is so easy to make and flexible. I have made it as a casserole and baked ahead, I have done all the pieces separate a day before and combined at dinner, and I have followed the directions exactly. No matter which way, it turns out lovely every time! I’ve made this and it’s great. Wondering if you have tried doing this in the Instant Pot yet? I would be interested if it comes out. 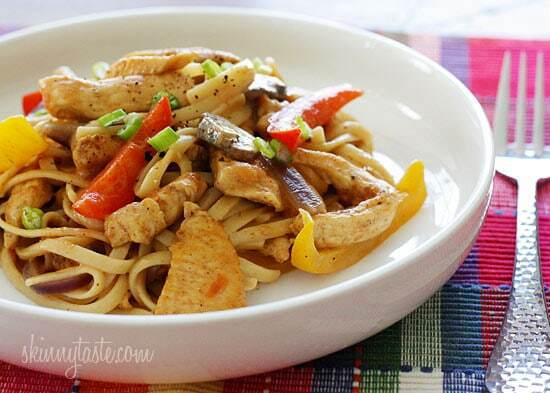 I’ve seen some other cajun chicken pasta recipes in the Instant Pot but I like yours. Maybe switch out the pasta for penne? My husband is lactose intolerant. We are looking at making this or Chicken Alfredo from your cookbook. Any recommendations to replace the cream cheese? Maybe one of the vegan or tofu cream cheeses? I made this dish again last night and it still hits the spot. The Cajun seasoning gives this weeknight chicken dish a great flavor. The fresh veggies stay crisp and there is just enough sauce for the pasta. I might try it with shrimp next time. Thanks Gina for keeping things healthy and interesting. SOOOO good! Don’t skimp on the Cajun seasoning! I have been “following” you, on your website for a few years now….I have never made this recipe…a bit of preparation work but worth it…. The liquid ingredient amounts are incorrect unless you’re looking for a soup. This came out super watery. I’m so thankful for your blog & recipes, Gina. You never disappoint! I did not have issues with the sauce being too thin, but I did use whole milk as we only have whole milk in the fridge. finally got around to making this and it was DELISH!!! I would like to add Shrimp next time like another commenter did. amazingly flavorful, not too spicy and so creamy. yum!!! can’t believe this is light or skinny! You’re welcome! Glad your family likes it!! Pretty much the best dish ever. I’m going to try rotini noodles next time as they’re easier for the kids to eat. My wife and I now only go to this website to plan for all of our meals. No joke, we’ve tried 20+ recipes and we have never been disappointed! Keep them coming! Any suggestions for a replacement for the mushrooms? Maybe just increase the other veggies? It took about 40 min this first try. I started right after i got home at 5 and we were eating by 6. It was yummy and i am going to definitely make this again. Now that i have a practice run i can do this in much less time. It was fantastic that even my 4 year old granddaughter loved it and she is some fussy.And the smells! I just made this for dinner and omg! Wow! Delicious! In awe of this recipe! Thank you for sharing this! Made this with zoodles! Its great! I made this recipe today, we loved it so much! Even my picky eating daughter finished the whole plate. Thumbs up! 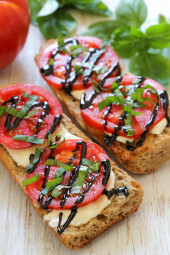 Would this be good with zucchini noodles? . Ive been on the zoodle train now and its amazing! I made this last night and it was watery 🙁 I think I will use less chicken broth next time and put it over brown rice without the pasta! This is SO so so so so so SO SO SO GOOD. Used Tony C's creole, heavily, on the chicken. Left out the mushrooms, used a green pepper in addition to the red and yellow, and added some baby spinach at the end. I could literally eat this every day of the week and I am so excited about it I'm commenting on an almost 4 year old post. Made this tonight. Very good! My cajun seasoning is very hot so I am glad I only put in one spoon full. Used chicken and shrimp. The shrimp is really good in this dish. I served this Christmas eve as part of my Pasta Bar. I prepped/cooked all ahead (except for the pasta). I just slightly undercooked the veggies. 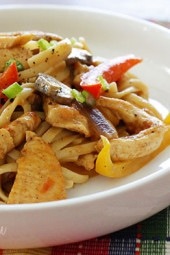 When close to serving time I gently reheated the sauce mixture and then tossed with the pasta. It was perfect and delicious! making this tonight for the first time. put through the recipe builder,(without the pasta) made it serve 4 rather than 5, and got 4 smart points. just allows me the option of less pasta, or no pasta and zucchini noodles on the side. Going to try this with zoodles!! My family DEVOURED this meal. My 16 year old went back for thirds and my picky 12 year old went back for seconds. I also used the homemade Cajun seasoning blend (2 tablespoons paprika 1 tablespoon salt 1 tablespoon black pepper 2 teaspoons garlic powder 2 teaspoons onion powder 2 teaspoons ground red pepper 1 teaspoon dried oregano 1 teaspoon dried thyme) and it worked perfectly. I have a little left over hiding in the back of the fridge hoping I get to it first! I just made this one and it was delish! But it came out a bit watery, I have put it down to being in a totally different country and having slightly different ingredients. To make it thicker should I reduce some of the liquid? Or increase the flour? I had the same problem at first. I made it “not watery at all” by reducing the slurry and eliminating the broth. Use ONE tablespoon of cream cheese, a splash of milk and a teaspoon of flour. It comes out with great consistency, lighter and even a bit more flavorful flavorful. Such a great, easy dish. Love this. I made this tonight. It was absolutely delicious. I forgot I only had almond milk and I didn't want to use it. However I had heavy cream in the refrigerator so I used it and thinned it out with some of the chicken broth. I didn't want to put the heavy cream in the processor and turn it to butter so I whisk the cream, cream cheese and flour by hand with a small whisk until it was just blended. Since I left the cream cheese out until it was room temperature It was very easy to whisk them together. 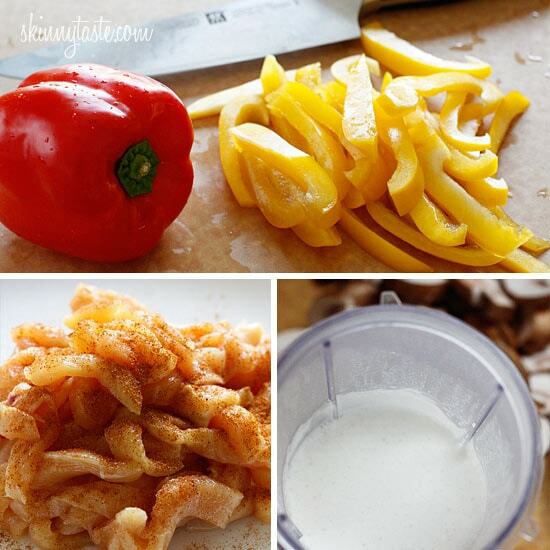 You've got to try this recipe!